Home » Historic Preservation » Research and Technical Preservation Guidance » Architect Biographies » Harry E. Nordquist Jr. Architect Harry Edwin Nordquist Jr. was born on December 13, 1910 in Seattle. After attending Broadway High School in Seattle, Nordquist received his formal architectural training at the University of Washington, where he received his Bachelor’s degree in architecture in 1933. By 1936 Nordquist had established his own architectural firm in the Textile Tower in downtown Seattle. The next year he recieved his architectural license (No. TL 209). A talented designer, his business quickly developed and by 1937 his staff of two (Paul Sutherland and Vsvolad Prisadsky) was doubled with the addition of Basil Miles and Jerry Auld. That year the Seattle Times reported that Nordquist had over $90,000 in projects on the boards throughout the city. All the projects were residential and ranged in price from $3,500 to $16,000 dollars. His early designs ranged in style from Colonial to Tudor Revivals and included homes for Maurice Shapiro (1937); A.J. Nyberg (1937); John Malm House (1937); E.A. 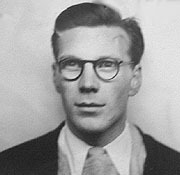 Warren (1938); M.M. Jensen (1939); and R.E. McGrew (1939). Nordquist had a knack for working with developers and builders and throughout his career. As such, he created plans for a variety of housing tracks thoughout the city including designs for twelve model homes for builder Harry Edwin in the Madison Park neighborhood (1939). After the war he supplied over 200 designs for homes in the Mercerwood Housing development on Mercer Island in conjunction with architect Thomas A. Smith (1955). Among his last projects before retiring were several homes in the Lake Highlands subdivision (1964) overlooking Lake Washington. Nordquist was an active member of the State Society of Architects, serving as their Secretary for a number of years. In the early 1960s he moved his office to Mercer Island but continued designing projects throughout the Puget Sound region. Notable projects include the Stanley Zielinski House (1958) in Bellevue; the Clyde MacDonald House (1964) in Kirkland; and the Tom Tabacco House (1970) in Seattle. Nordquist was also an avid bowler and he used his passion to acquire several architectural commissions. Over the course of his career, he designed several bowling alleys including Greenlake Bowling (1949); The Ideal Lanes (1949) in downtown Seattle; Roxbury Lanes (1958); and Centennial Lanes (1976) in Kent. He also designed several apartment complexes including the Parkside Apartments (1954); and a multiplex at 6011 California Ave. SW in West Seattle (1959). Other projects include the Ferncrest Sanitarium (1959) on Beacon Hill; and the Ferncrest Sanitarium (1963) in West Seattle. State Architectural License - November 28, 1934. "Engagement of Miss Jane Ryan is Announced", Seattle Daily Times - March 29, 1939. "200 Lots Sold in Project on Mercer", Seattle Daily Times - March 13, 1955. "Broadmoor Air Conditioned Brick Colnial Open Today", Seattle Daily Times - January 1, 1938. "Old Buildings to be Handed New Roles", Seattle Daily Times - July 11, 1982. "Construction Starts on Kent Complex", Seattle Daily Times - August 8, 1976. "In West Seattle", Seattle Daily Times - March 8, 1959. "New Homes to Cost $90,000", Seattle Daily Times - April 6, 1937. "Residential Permit Total Hits $45,000", Seattle Daily Times - February 19, 1939. "Work to Start on Warehouse", Seattle Daily Times - November 3, 1937. "West Seattle Nursing Home", Seattle Daily Times - January 20, 1963. "Open House Today at New Sanitarium", Seattle Daily Times - September 29, 1963. "Home Beauty Combined with View", Seattle Daily Times - June 12, 1949. "Committee Split on Zoning Request Averted", Seattle Daily Times - March 17, 1960. "Florentine Flourished In a Rainier Baech Home", Seattle Daily Times - August 16, 1970. "Under Way", Seattle Daily Times - April 20, 1958. "Zone Change On Bowling Lanes Asked", Seattle Daily Times - January 16, 1960. "From the Scorebook: Vitalich Ordered the Best; His Alleys Cost Quater Million", Seattle Daily Times - October 10, 1949. "Apartments Open for Inspection", Seattle Daily Times - May 2, 1954. "Twelve New Brick Homes in Madison Park on McGilvra Blvd. ", Seattle Daily Times - September 17, 1939. "A Suburban Home with 'Elbow' Room", Seattle Daily Times - September 9, 1964. "Plan for Balcony Plazas Developed", Seattle Daily Times - June 1, 1973. "Nordquist Rolls 266 and Reverse", Seattle Daily Times - February 13, 1948. "Architect Appeals in Setback Fight", Seattle Daily Times - July 11, 1956. "Four Homes To Be Open At Lake Highlands", Seattle Daily Times - March 22, 1964. "Development Open for Sale of Homes, Lots", Seattle Daily Times - October 25, 1964.